The latest bar from Mr Fogg's family has its own gin distillery and the Rangoon Steamer ship inside. Inspired by Mr Fogg's better half, his Indian wife, Aouda, Mrs Fogg's Maritime Club and Distillery in Broadgate Circle serves up Indian-spiced cocktails and dishes that give a nod to her heritage and her nautical travels. The first project from Charlie Gilkes and Duncan Stirling's Inception Group to open in The City, Mrs Fogg's plays on the exotic flavours, ingredients and relics Phileas Fogg's wife found on her travels. Keralan fried chicken, mini mango salads, sweet potato pani puri and jackfruit biryani are typical dishes, presented in traditional Indian tiffin boxes. Filled with the sights and sounds of a faraway port, the restaurant has a large central bar on the ground floor, surrounded by lush foliage, large wooden fans and antique nautical finds. Downstairs, in engine room - a secret space filled with all sorts of cargo, crates and stowaways - there's a live entertainment space and a Rickshaw, courtesy of Monkey Shoulder, where you can pedal and shake your own signature cocktails. Mrs Fogg's Maritime Club and Distillery clubs, bars, cabaret nights, casinos and interesting nightlife. 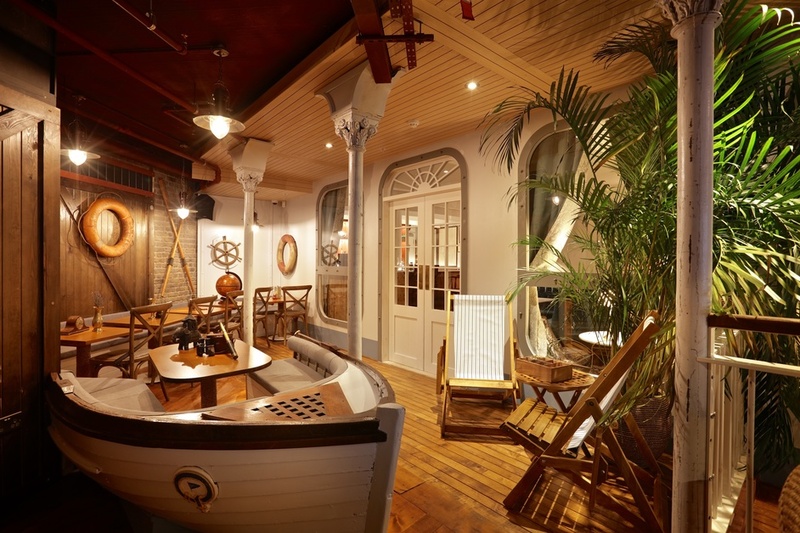 What are the best dining options near Mrs Fogg's Maritime Club and Distillery London? Mrs Fogg's Maritime Club and Distillery gyms, sporting activities, health & beauty and fitness. The best pubs near London Mrs Fogg's Maritime Club and Distillery. Where to have your meeting, conference, exhibition, private dining or training course near Mrs Fogg's Maritime Club and Distillery. From cheap budget hotels to luxury 5 star hotels see our deals for Mrs Fogg's Maritime Club and Distillery hotels, including 196 Bishopsgate Serviced Apartments from 85% off.